First off, I'd like to wish a "happy trails" and a "Godspeed" to my fellow hikers. Tomorrow marks the big start date for the A.T. More than 200 hikers will be heading to Springer Mountain in the next day starting what they believe will be a 2175 mile hike. So good luck everyone, and take it one step at a time. Personally, I'd like to wish a good luck to a friend of mine, Greg Stevenson. So...good luck Greg, and may you walk to Maine and stand upon Katahdin. As far as a PCT update, well I've been packing stuff up in large boxes that I will sort through later, once my departure date gets closer. I have decided again, to lay everything out at my mom's house so that I make sure to have everything. I will two "sets" of gear. Set 1 will be what I carry for Southern Cali and set 2 will be for the Sierras (provided I make it that far). I will also have a box of extra that I leave at home that will have some things that I may decide I want (that can be easily mailed). Also, I will have a bounce box with things that need refilled: ie. batteries, foot lube, toothpaste, etc. I will not be bouncing it to every stop...probably every other. Great book for mile by mile detail...but not much else. There are no town descriptions, or maps, just mile by mile checkpoints to follow along the trail. It is pretty small and light, so will probably come along on my hike. These books (3 in the series), have incredible written detail about the trail. There are pages and pages dedicated to every mile of along the way, with specifics of every turn and twist. There's also info on the local communities, culture, and history. Included in the books, are nice maps that detail the route. 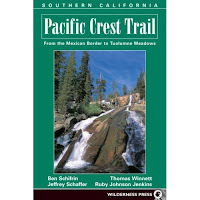 These books are incredible big and heavy and are great for prepping before hand, but not sure about along the trail. I may cut some pages out and carry them. Yogi, a former thru-hiker, created her own handbook that is an invaluable resource to hikers on the PCT. While it mirrors the data book on a lot of it's mile marker highlights, it also has an immense amount of data concerning towns, and hiker hotspots. You will get information on hotels, current rates, restaurants, gas stations, secret water caches, hidden hiker tips along the trail...etc. It is a fantastic resource for those of us that love sucking the marrow out of the towns and zero days. 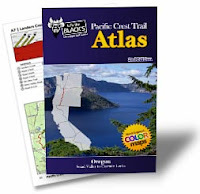 Former thru-hiker, Erik the Black, has come out with another solution: The PCT Atlas. These books (5 in the series) aim to combine all of the data from every resource into one solution. The books contain mini maps for every section, tabled data-book style mile-by-mile data, minimal town info and maps, and elevation profiles. An overall great solution, although the town info is limited and the price of these books is rather hefty. 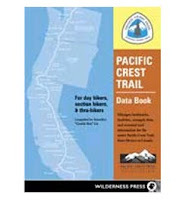 The PCT official maps (12 in series), are very nice, water proof maps that cover the entire PCT. They come folded with four sections per map. The maps have marked cut lines so that you can cut only the sections you need. These maps are tough, and include elevation profiles. In combination with the data book, this would be a great solution. 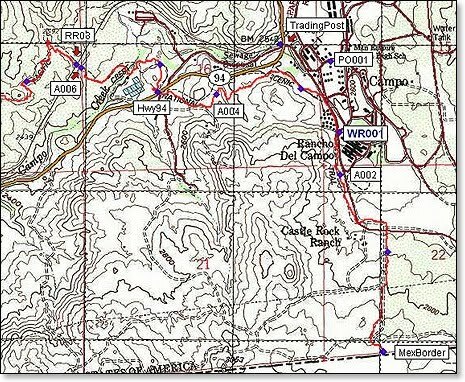 The website, pctmap.net, offers everyone the ability to download topo maps for the entire PCT, with elevation profiles. These maps are up to date and have incredible detail. If you want to go to the trouble of printing them yourself, these could be very useful. 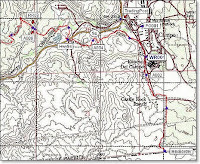 In addition, pctmap.net, offers waypoints (a .gpx file) for the entire trail to uploaded into a GPS. I have downloaded the data and now have waypoints for the entire trail in my Garmin GSPmap 60csx handheld with a resolution of a point every 1/2 mile. The nice thing about these data, is that they are recorded by someone who actually hiked the trail. As you all know, trails move and change over time due to reroutes and various other reasons. These data points, are current as of last year. The only downside is that I would have to carry my gps, and batteries. I may carry it and only turn it on when I'm having trouble navigating...or in the snow-covered sierras. That's it so far...no solution yet, but as you can see, I have a lot of options. Looks like I've found a temporary home for my cat. A nice family has offered to take him in for as long as I need. I can come get him at the end of summer, or let him stay with the family in case I go back to Antarctica. I think he'll fit in well with them. PCT Prep Update #1: Muesli, Gear, Permits, To Do's, etc. Preparations are coming along for my hike. This will be the first of a handful of updates that I will post that talk about how I am preparing for my PCT walk. This morning's edition of the Centre Daily Times Newspaper here in State College ran an article about my hike. I will be the first to admit that vegetarian comment should read: "for over 1 year" not "for two years", but that's my fault for stating it wrong during the interview. 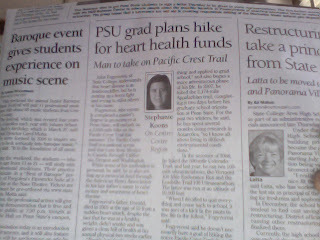 Check it out: "PSU Student Hikes for the Heart"
1. An official Thru-Permit. This permit covers you for all camping in National Parks along the hike AS WELL AS an official pass to climb Mt. Whitney. You are supposed to apply for this permit if you plan on hiking more than 500 miles on the PCT. You should apply for this permit at least two months prior to starting your hike. While the permit is free, the Mt. Whitney portion costs $15.00 (should you decide you want to hike Mt. Whitney, which you would be a fool not to). My Update: Thru-Permit Received and Approved! 2. Canada Entry Permit. This permit is necessary to enter Canada at the Northern Terminus point. Since the trail does not end ON the border, hikers are required to hike about 8 miles up to Manning Park in British Columbia to finish. This means you need permission. Since there is no obvious border guard in the middle of the woods, you need to pre-apply for permission. This permit MUST be applied to at least 2 months prior to starting in California. It involves filling out paperwork, mailing it to Canadian borders services, and the having an approved portion mailed backed to you. Also, you must have this permit on your person, when entering Canada, and when re-entering the US in Seattle (or wherever you come back to the States). My Update: Canada Permit Received and Approved! 3. California Fire Permit. While this is sort of a silly permit, technically, California does require it if you are using a stove or fires anywhere in the National Parks. To obtain, it just requires answering a few questions online, and printing out a certificate. My Update: Fire Permit Printed and Signed! 4. Passport. That's right, going to and from Canada by car does now REQUIRE a passport. So, you must have it on you before crossing the border. The best bet is to mail it to you last PO drop (Usually Stehekin WA) along with the Canada Entry Permit. My Update: Passport Up To Date! I will have a video up on youtube shortly about this. I don't have much to say about gear right now, other than I have most of what I need. 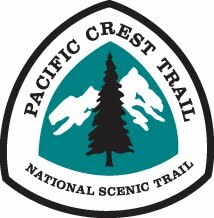 Unlike the AT where one "set" of gear got me by on the entire trail, the PCT is truly a sectional trail when it comes to gear. In Southern Cali, you can get by on a 40 degree bag, and a tarp. In the Sierras, you need much more warm gear, more clothing, and a bear cannister. Most people swap out gear at Kennedy Meadows. This will be my approach, provided I make it that far (700 miles). 2. Buying all of the food that I want to pre-buy. I don't plan on buying 2500 miles of food, but I will buy some. I will be resupplying a lot more from trail stores, rather than PO drops, but will still buy a significant amount of food up front. 3. Plan and pack mail drops. 4. Find a home for my cat. That's it so far. In four weeks, I will hiking from Campo to Lake Morena and then enjoying the Kick-Off festivities. In light of a very difficult past few months, I have decided to step away from this format for a while...and will take a hiatus from "personal life" blogging. Most of you know that I will be hiking again this summer. For those of you that guessed the PCT, you were right. That's where I'm headed. This trip holds many similarities to my AT hike in that it will be just as much an internal journey as an external one. I could go into detail as to why, but I won't. The short answer is that I need to walk. I have one and only goal in my mind right now...and that is to go to Campo, and walk North for a while. That is it. I will get, as far as I will get. period. -I will keep this blog up as a way to post an informational update here or there from the trail or during my preparation. I will continue to post entries concerning logistics....ie planning, packing, gear, food, etc (mostly informational), but that is all. I'm taking a break from personal postings. I may try to send occasional location updates through GPS so that family knows where I am, but that will depend on reception and battery usage. -I will probably make videos for those interested in my planning/gear, and will record videos from the trail, but may or may not post them on youtube. -I will not be updating nor using facebook (save maybe....and that's a big maybe.... a rare picture once in a while). I'm pretty damned burned out with facebook. -Finally, this could all change once I start walking, and I may decide I want the world to know everything I'm faced with daily...although that is very unlikely. -This is not a "woe is me"or look...john is so "emo" now, post. I am simply telling you all that i'm disconnecting my personal life from the web....for a bit, while I go for a little walk. As far as my other big decisions...I have decided on a PhD program, but cannot talk about it yet. Also, I have been accepted to return to WAIS Divide, Antarctica for a 3rd season...this time as an employed science tech/core handler. Actually going again, will depend on several other things. That's all I have right now. Wish me luck. I will really need it this time. really. I will post some factual details concerning the PCT soon for those of you interested. But you can also visit www.pcta.org for information. I've recently made some tough decisions and will try to post all about them in the next day or two. Some of them, are pretty expected and will come as no surprise, some...maybe not so much, but ALL the right decisions for me. As for now, I am late for an appointment with some hair clippers (it's getting all shaved off!). 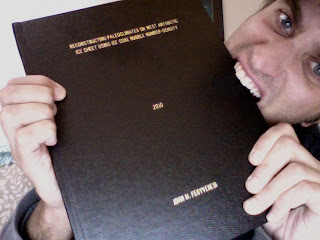 So please enjoy this photo of me, chomping down on the bound copy of my thesis which I finally received today. Yummy. here's a quick slideshow of some of my New Zealand pics from this year. It is that time of year, and normally I would credit the overwhelming feeling that I'm having to the usual: "Springer Fever". The unyielding desire that comes in early Spring, to head back to the trailhead and start walking. This year....well this year is different. I am sitting in my rather mundane and average apartment, living a rather mundane and average existence, with a notion in my mind that is unshakable. Very soon, I WILL be at the trailhead. I have made the decision that I will be hiking again very soon, and am simply sorting out some details right now. Rest assured, it will happen. I have been thinking seriously about another hike since my time in Antarctica. Asking myself things like, "How much time will I have? ", "Where do I want to go? ", "What will my money situation be?" and "How much time do I have for planning?" The past few weeks a few things have made this whole idea become more of a reality. Of course I still haven't made an official decision on graduate school yet, but what I've come to realize is that it won't matter. I am still going to go walking. I was online reading some trailjournals and getting some ideas and a ran across one quote that really spelled it out for me. It's good to know I am not alone when I say that the trail is where I am drawn to, and where I must go. To anyone who hasn't been through it, there is no way to explain it in words. So....like always, I have a superstition about announcing big events before they become official. Once my plans become "official" (ie food bought and airfare purchased), I will spell out my plans on here in full and gratuitous detail. Until then, happy trails everyone, and this is going to be one hell of a summer!